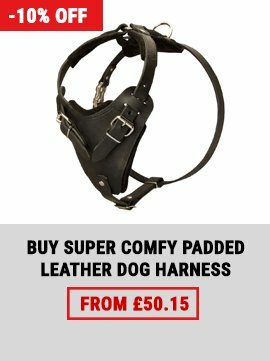 Which Dog Harness to Buy - Leather or Nylon? 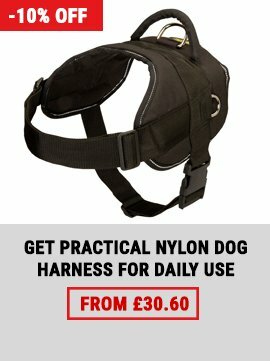 A harness is more practical and safer gear for a dog. The harness doesn't hurt the pet's neck when it pulls on the leash. 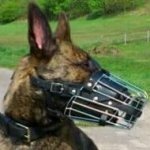 The harness is also more functional than a collar. 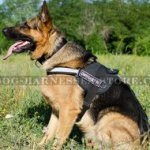 Your dog will feel more comfortable and you will get more control over the pet with the harness. 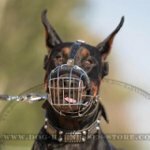 If you hesitate over a choice between material for dog harness, this comparison article will help you to take the decision. The harness of genuine leather is of selected quality. It is extra durable and convenient. Leather is thick and strong, but soft and safe for dog's skin. It is well-oiled and perfectly processed. All the edges are rounded to avoid rubbing. 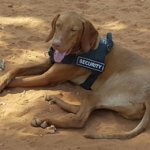 Your dog won't feel any discomfort even staying for a long time with this harness on. The harness has wide range of use. It is used by professionals for attack and agitation training, police and service work. 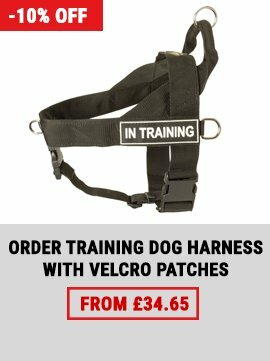 This harness is also suitable for obedience training and daily walking. 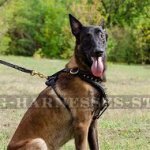 It is the best for medium and large dog breeds, which are powerful or active and need reliable control. 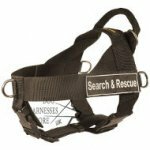 This leather harness has wide chest plate to distribute loads along the dog's body evenly, to provide comfort and to protect from shocks during protection training. The chest plate is lined with thick and soft felt for maximum safety. Back plate and neck straps are also felt padded. 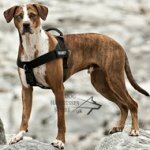 The harness is 4 ways adjustable, but you needn't do this any time you put it on the dog. 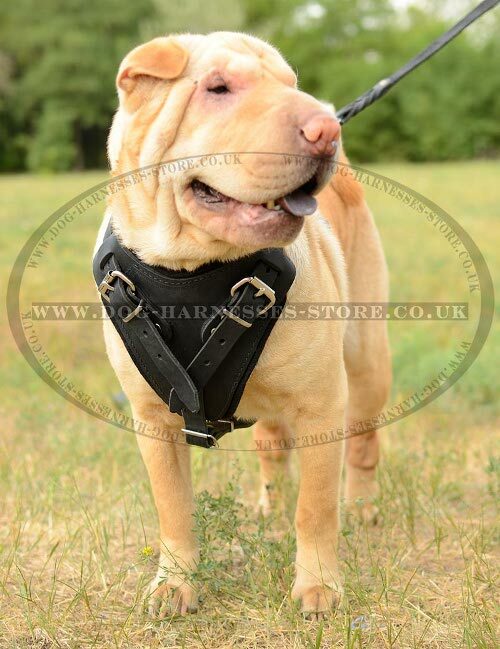 There is a quick-release buckle, which helps to get your dog into the harness within seconds! All metal details are welded. They are heavy-duty and rust-resistant. 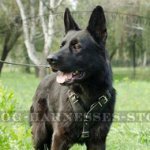 The harness is produced in black and brown colors to your choice. 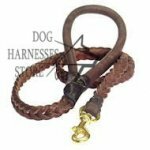 You can also order this harness with a handle that will be placed on the back plate near the D-ring for leash fastening. 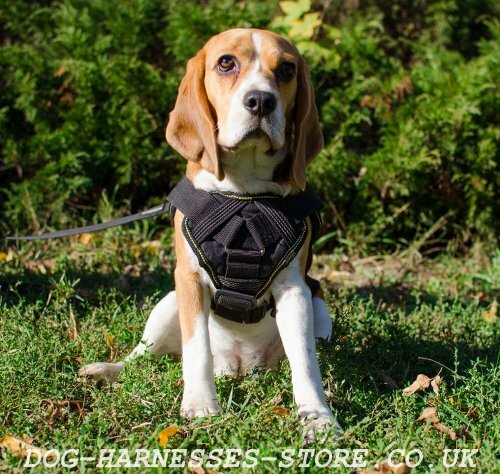 This leather harness is perfect for strong, active and working dogs! 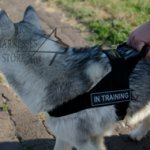 Our nylon harness is a multifunctional outfit, which is used for a variety of dog activities, such as walking, training, service work, sport and weight pulling. Nylon is hard-wearing, stretch and water-resistant material. The harness is used in any weather and is easy to clean. The material is dog-friendly. The construction of this harness is safe and cosy. 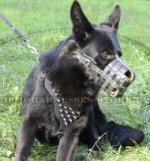 Your dog will have no rubbing and skin irritations even being harnessed all the day long. Chest plate of the harness is large and cushion-like. Your dog's breast is fully protected with this plate. 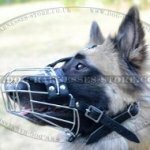 Back plate is wide and fitted with welded D-ring for leash and a control handle. The handle helps you to grab the dog and to hold it nearby when you cross the road or in any other situation. There are also 2 side D-rings for pulling work. All the rings are break-resistant and intended for heavy loads. Durable nylon straps are adjustable in 4 ways. You can always regulate the size of the harness. Quick-release buckle is made of molded plastic. It is solid and handy in use. 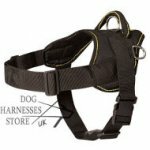 The harness is suitable for small, medium and large dogs. It is the ideal variant for a broad range of use!